Rack of lamb is the most expensive cut of lamb, also fittingly known as the ‘best end’. A rack of lamb generally serves two people. When the rib bones are scraped clean, the rack has been ‘French trimmed’. 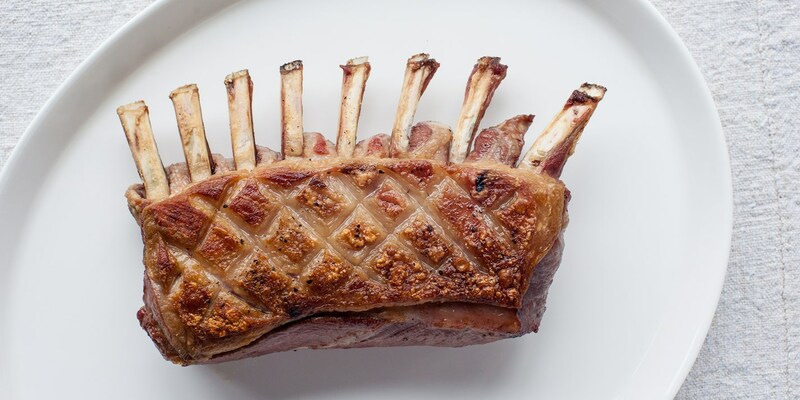 A crown roast is 2–3 racks tied together to make a circle. Lamb rack is best seared in a pan and finished in the oven. Be sure to remove the meat from the fridge before cooking so it can come to room temperature. Alfred Prasad marinates his lamb with a mixture of Indian herbs and spices 15 minutes prior to cooking, while Matthew Tomkinson coats his lamb rack with mustard and a herb crust for an added texture.